Philippine rescuers on Monday searched desperately for dozens feared buried under a landslide unleashed by Typhoon Mangkhut, which also left a trail of destruction in Hong Kong and saw millions evacuated in southern China. The confirmed death toll across the northern Philippines, where the main island of Luzon was mauled by fierce winds and rain, reached 65 and was expected to rise further given the number of missing. Four more were killed in China's southern province of Guangdong. 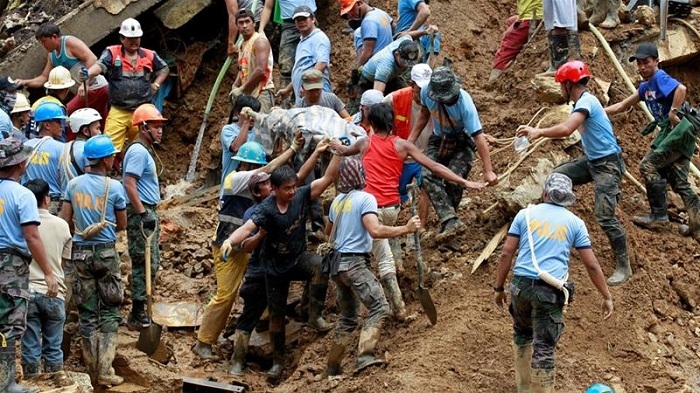 Searchers used shovels and bare hands to dig through mounds of rocky soil in the northern Philippine mountain town of Itogon, where 11 bodies have been pulled from the rubble and dozens more may still be trapped after a landslide buried an emergency shelter. Relatives of the missing were among those taking part in the search for survivors, with little hope they are still alive. "We believe that those people there, maybe 99 percent, are already dead," the town's mayor Victorio Palangdan told reporters. Tearful families surrounded a whiteboard bearing names of the dead and missing as others inspected recovered bodies for signs these could be their loved ones. Joan Catteg, 42, told AFP her missing cousin Harvey had taken shelter at the bunkhouse. "He texted his wife not to worry. He said nothing bad will happen to him and that once the rain stops, he will go up. But he hasn't returned until now." More than 155,000 people remain in evacuation centres in the Philippines two days after Mangkhut -- the world's most powerful storm this year -- struck, said national police spokesman Benigno Durana. Across northern Luzon, which produces much of the nation's rice and corn, farms were under muddy floodwater, their crops ruined just a month before harvest. Hong Kong began a massive clean-up Monday after the typhoon raked the city, shredding trees and bringing damaging floods in a trail of destruction. The monumental task of cleaning up began as residents, some in suits and ties, struggled to get back to work on roads that remained blocked by felled trees, mud and debris. Bus services were halted and commuters piled onto platforms trying to board infrequent trains after trees fell on overhead power lines. Schools will remain closed through Tuesday. The storm, with gusts of more than 230 kilometres per hour (142 mph), sent buildings swaying and water surging into homes and shopping malls in Hong Kong, with some roads waist-deep in water. In the neighbourhood of Heng Fa Chuen, thousands of rocks and pebbles from the sea covered parkland along the coastline which had been battered by waves. The city's main Victoria Park became an obstacle course with hundreds of trees down and many completely uprooted. They opened again on Monday but Macau was still in recovery mode after severe flooding hit parts of the city, forcing emergency workers to rescue people from shops and homes using boats and jetskis. On Monday morning, shopkeepers in Macau were hosing down their stores which had been caked in mud after the floodwaters receded. Authorities there said they had evacuated more than three million people and ordered tens of thousands of fishing boats back to port before the arrival of what Chinese media dubbed the "King of Storms". In the city of Zhuhai, a stone's throw from Macau, volunteers and police pulled fallen trees and debris off highways. "I think it will take us three or four days before it gets back to normal," said Zhang, a police officer clearing a road near Nanshui town. Rice paddies and banana plantations along the highway were flooded and destroyed, while some factories in nearby industrial areas suffered damage. "I was scared. I didn't dare go out last night. At one point the flooding was this high," said Zhen Jingli, from Yashao village, pointing to his waist. In neighbouring Guangxi, alerts were issued for a dozen rivers running high due to the downpours and expected to rise even higher, leading to possible floods in the next 24 hours, Xinhua news agency reported.